Black light theatre in Prague is a unique non-verbal spectacle that will blow you away with its beauty and visual artistry. You will not only encounter Dr. Frankenstein, but also other well-known characters from the worlds of detective stories and horror. Slightly absent-minded mad scientist Dr. Frankenstein is obsessed with the idea of creating an artificial man. He invites famous figures from horror and detective tales to help him achieve his goal. He re-awakes the Invisible Man, Sherlock Holmes, the Hound of the Baskervilles, Dracula...Expericence the unexpected adventures on your journey across Europe at the side of Dr. Frankenstein. You will find yourself surrounded by dancing jellyfish in the depths of the ocean, see the Eiffel Tower in Paris come to life, your journey across the Alps in traditional dress is accompanied by the yodelling of sprightly highlanders, and Vienna lives up to its reputation as the city of the waltz. In the depths of Transylvania, beneath the castle of Count Dracula, a gipsy woman predicts...success or failure? 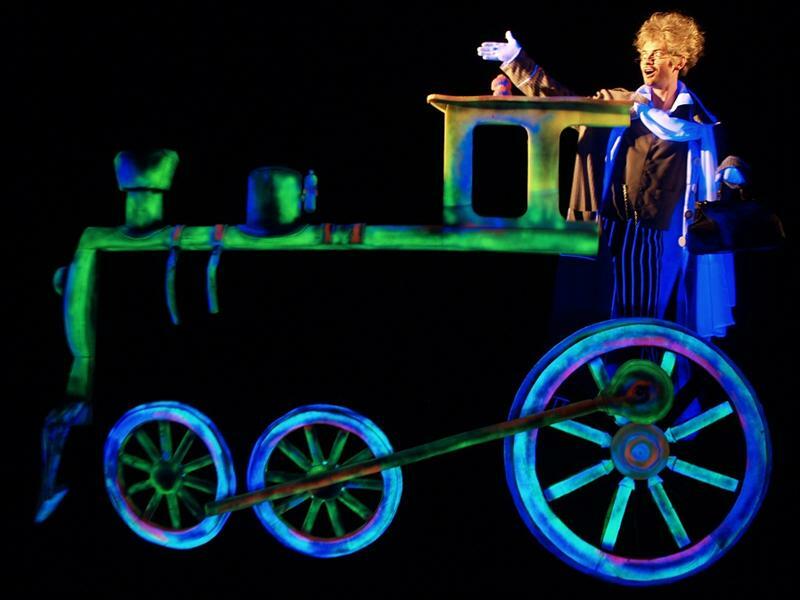 The Frankenstein show utilises all the classic elements and imaginative effects of black-light theatre. Stirring musical score complete the interesting story, which, thanks to its poeticism, exaggeration and humour transcends its origins in horror so much that it is an understandable and fun spectacle for people of all generations. Mary Godwin spent the summer of 1816 with her future husband, Percy Bysshe Shelley, on holiday at the home of Lord George Gordon Byron. Rainy days were spent thinking up various horror stories. It was at this time that the student and later scientist Viktor Frankenstein, obsessed with the creation of the perfect human, first saw the light of day. The novel "Frankenstein" was published in 1818, was re-worked many times and is today considered to be one of the founding works of the horror genre. That same rainy summer, and that same place, saw the creation of another classic figure of horror stories - Lord Byron wrote the draft of the story "The Vampyre", which later became the original inspiration for 'vampire' horror stories, e.g. the novel "Dracula". So it was that two classic motifs of horror tales came into existence simultaneously, and completely by chance. To learn more about black light theatre go to What is Black Light Theatre. The Black Light Theatre of Prague is full of dance and colours. Let´s have some fun! Be absorbed by the special light effects performance! Visit the Black Light Theatre of Prague located just 5 minutes away from the Via Musica shop in the centre of Prague on the Old Town Square. You will enjoy all the classic elements and effects of black light theatre. Thanks to its poetry, exaggeration and humor the performance is funny and understandable for people of all generations. The Black Light Theatre of Prague is located in a 17th century building, a former monastery of the Carmelites of St. Gallus order. When the monastery was abolished in 1786 the building was used by a lace manufacturer followed by a number of shops. In 1930s the building was reconstructed and the hall was changed into a classy café. Under communism the House of Soviet Science and Culture was based there and the auditorium was adapted for lectures and concerts. In 1993 the Black Light Theatre of Prague was founded allowing visitors to enjoy Prague black light theatre performances in the foyer with original 18th century stucco details and ceiling frescos featuring Biblical themes such as the Last Supper, Jacob’s dream and Christ in Emmaus.